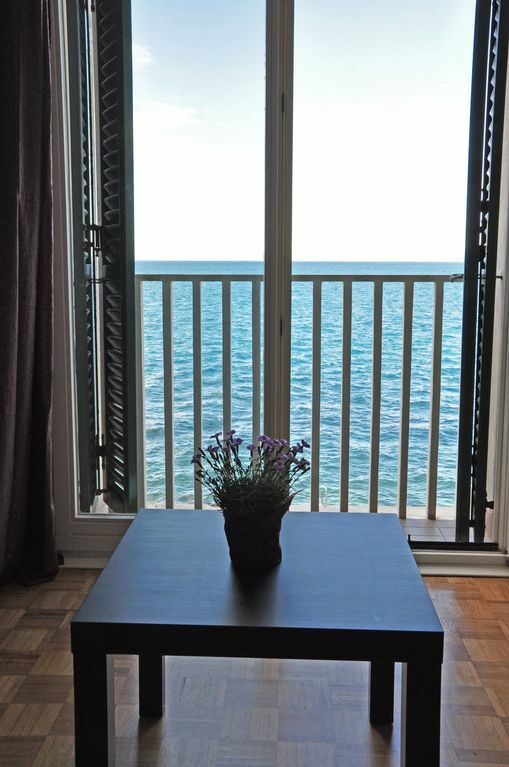 Our apartment is located direct on the sea and offers unobstructed view of the Adriatic Sea, with Italy at the horizon. Walk out of the building and you’ll find yourself on a pier for swimmers, sunbathers and divers! - panoramic sea view direct from your living room sofa and dining area! - Facade was renovated in 2018 - beautiful place! Piran is closed to traffic during the summer season, covered parking garages are available at town access points, with free shuttle bringing you close to our building. You will enjoy car-free promenade along the sea! Fully renovated bathroom comes with a sea view. It is equipped with a shower cabin, sink, toilet and a brand new washing machine. There is a beautiful sea-view and lots of light! Enjoy the panoramic sea view right from the living room sofa and dining area! Adjoining dining area: seat at the bar island or at the table - both facing the sea and offering gorgeous views! TV with Chromsact technology - stream your favourite shows/movies from your iPhone/iPad! We chose Piran for a holiday without knowing anything about the town. We are very pleased we did. We enjoyed a week relaxing in this very well appointed and superbly located apartment on the waterfront in Piran. We swam in the crystal clear water every day. Everything - the apartment, the view, the waterfront location and Piran - is 5 star. Anna, who manages the apartment, was professional, very responsive and friendly. Fitmin, who manages the Punta Cafe a few steps away from the apartment was so friendly and welcoming that we made it our place to sip our daily coffee while watching the sea and passers by. We are sorry we could not stay longer. Great location, appartment had everything we needed. We loved Piran, the people are friendly and it was so much fun walking the alleys. The town is clean and cozy. October was a good time to visit. Perfect apartment to stay in Piran even though a bit too expensive. Nevertheless highly recommended. Manager of the apartment was very helpful. Thank you for sharing your thoughts, I am glad you enjoyed your stay! If you come to Piran again, you may want to take advantage of our discounted weekly rates - and experience more great things around Piran! Nice, clean house with two bedrooms. The master bedroom contained a lot of space to store the clothes. The smaller bedroom did not have any cabinets (but there is plenty of room in the bigger bedroom). There is also the opportunity to dry your clothes on the balcony with roof in the back. The beach is just across the street (took us approx. 2 min). There are nice restaurants nearby. A supermarket is also pretty close. Only problem: Parking was pretty spendy. In total, we had a nice vacation in Piran. Wir haben uns für die Wohnung wegen des Blicks auf das Meer entschieden und haben es nicht bereut. Die Wohnung liegt perfekt, direkt an der Strandpromenade, aber relativ am Ende - so dass Abends kein großer Trubel ist. Die Wohnung ist gut ausgestattet und die Betreuung vor Ort durch Anna sehr gut. Alles wunderbar! Nur die Modalitäten bzgl. An- und Abtransport des Gepäcks waren anfangs schon gewöhnungsbedürftig, weil ca. 500m zu Fuß viele Koffer schleppen über Grobpflaster, zudem 10€ für Kurzparken zwecks Abladen - unverschämt:-( Bei der Abreise war man dann "routiniert" genug, es besser zu machen:-). Im Parkhaus herrschte auch zuweilen immense Konfusion, weil selten besetzt!!?? Das waren aber alles in allem nur Nebensächlichkeiten, obwohl es am Anreisetag schon extrem nervte... Es war auch etwas "unfair", uns die erschwerten Bedingungen betreffs "autofreier Stadt" erst kurz vor Anreise mitzuteilen..., das gehört schon in die Repräsentation der FEWO hinein - wenn es auch manch einen Urlauber abschrecken könnte!! Danke aber trotzdem für die Super-Woche!! !